When it comes to winter, it’s all about the layers. Wearing cozy knits, long sweaters, and cashmere scarves while sipping on home made cocoa or a hazelnut latte conjures up the perfect vision of winter, doesn’t it? With the dropping temperatures and small arctic chill in some parts of the country, we are quite fortunate to have very mild winter temperatures here in Southern California, aren’t we? Well, let me say that I've been loving the winter wardrobe lately. I've been pulling out my wool socks to pair with boots and all my cozy cashmere and cotton sweaters to stay warm. It's certainly a welcome reprieve from the warmer temps we've felt so far this year. I, for one, am certainly happy to see the soft, muted colors that awaited me in my winter closet. Whichever part of the country or California you’re in, I’m sure we can all agree that layered style is where it’s at this winter. Let’s pull out our knits, our cozy cape sweaters, and layer up, shall we? Wondering what to layer? Think cozy to start. It's all about the leggings, skinny denim, even corduroy pants. Winter is the perfect time to build with cozy, heavier layers. From there, layer on top too. Think button downs, paired with a cashmere pullover, or a long, loose knit tunic over a popover top. Then add a cozy patterned scarf to bring the outfit together. A good style rule? If you're structured on the bottom, then loose and flowy works on the top. 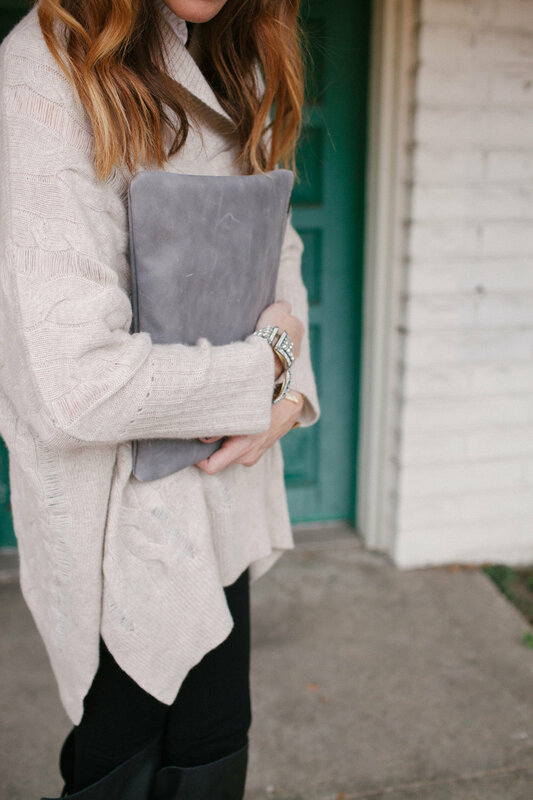 A perfect cozy, winter style combination.